A few days ago the 5.0 version of this site went live. I’ve been hard at work redesigning and coding for the past few weeks, learning how to do all the things I wanted to do through simple CSS and html. It can be an incredibly frustrating experience at times- but when finally the pixels click into place, the target image floats properly left, it can feel like a momentous achievement. This version got me started in blogging, around 2007, before I was heavily into haikyo and before I started posting my writings. I was inspired by my friend Canadian Mike to make a Japan-entertainment blog, with reviews of wacky products, bits of odd Japangrish, interesting people and structures. Back then getting 100 hits a day was an awesome achievement. Comments were a delight. The site was branded big red dot, after the dot in the Japanese flag. Mike was kind enough to make me a logo incorporating it- which must have been galling for him because shortly after that I switched over to a self-titled blog and left his logo behind. At this point (2008/2009) I decided I wanted to leverage my site to promote my writings, with the ultimate goal that I would sell my published books to a pre-built readership base. In publishing they call it your platform, and emphasize how important it is to do the leg-work of getting readers yourself. So, I started posting more stories. I continued with the Japan content but it took more of a back-seat, with haikyo coming in somewhere along the way. 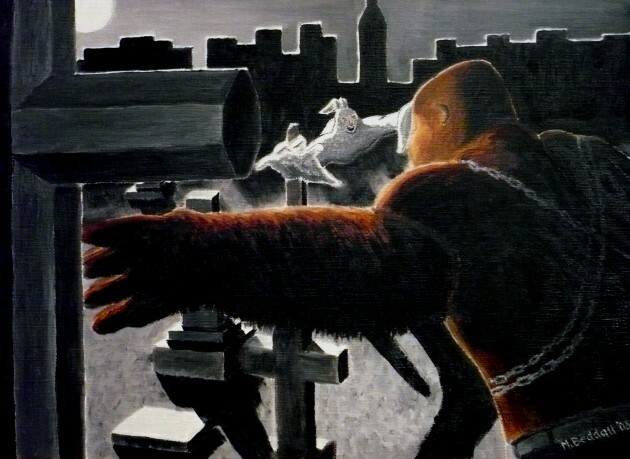 Again Canadian Mike was responsible for my header image- clipped from his painting of Killin Jack attacking the last of the Bunnymen. It set me on a path of seeking out a spooky-ruiny-fantasy looking city-scape shot. Here’s the full painting Mike did- I clipped the skyline and tinged it blue. With version 3, which was fairly short-lived, I wanted to jettison the Japan content (which I felt was kind of frivolous and silly at the time) and replace it with a fiction magazine which would accept submissions from other writers and pay them if I published them. I registered my site with ralan.org, the main listing of online fiction magazines, and even published a handful of stories, paying a handful of writers $10 a pop. At the same time I experimented with ads on the site, with roll-over graphics, and with a black theme. The tipping point came when it seemed that the site was so heavy it crashed for many people, and the number of writers sending me stories to publish fell off completely. At times it was dark on white, with the full name as above- out of ruins these hands built a tower 15 fathoms high, which was inspired by long song titles by the band A Silver Mt. Zion. I also started adding ruins content from around the web- with photos and articles and sourced through Google or whatnot. I mostly stopped that though because I felt bad to have ads while at the same time using other people’s photos. Also it was just recycling content produced by other people, which felt a bit like surfing their hard work. Here was the first appearance of the city roll-overs. 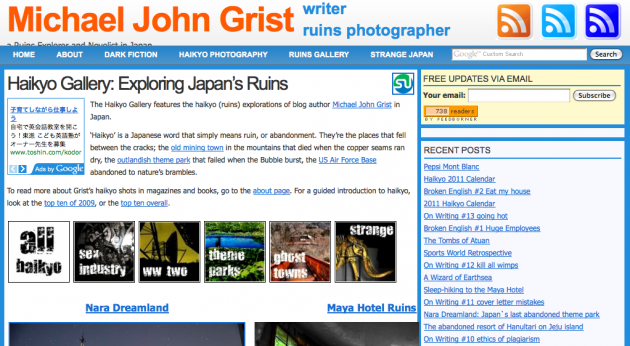 I left the outofruins design and moved back to a self-titled blog for several reasons: people told me the site was too heavy with images and ads and crashed a lot, I wanted to bring my name back to the fore as a tool for self-promotion, and I wanted to be free to put ‘frivolous’ Japan content back into the site. This most recent was darker, though of course it had that yellow in it. I loved the Fictioner / Haikyoist cartoons SY made for me, so I built the site around their color scheme. I experimented with various widths, in an effort to keep a sidebar, but have wide post sizes as room for large haikyo photos. In the end I decided it was too chaotic, still too bright for what the site was supposed to be about, and also not at all clear from a mere glance what it was all about. This latest, you can see it all around. 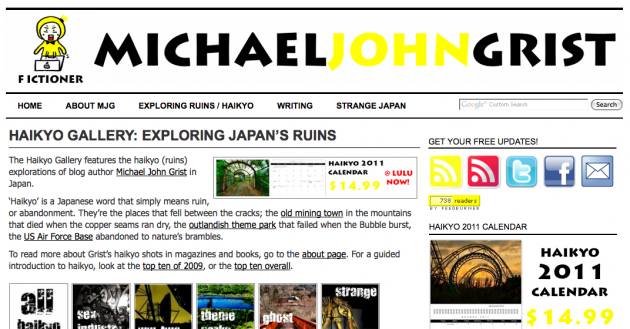 It incorporates the self-titling with the cityscape of Out of Ruins, with the magazine style that keeps haikyo or dark-fiction themed posts near the top so passers-by get an accurate idea of what the site is about. Down below though you can still find the fun Japan content and of course my writing news, reviews, and updates. The header image may yet change, if I can find an artist who can give me something better / more evocative. It seems difficult though to get across the ideas of ruins and fantasy at the same time in one image. We’ll see though. I like it for the clean design and layout, and also because I figured out how to have posts of varying widths. Now the haikyo posts have no sidebar, so the image can be very wide, while the regular posts remain narrower to the left. I love the new design and think it’s quite suitable for the variety of content you publish. It’s clean and easy to navigate. I have no idea when I started following your site, but I recognized all but the first “iteration” and enjoyed reminiscing about the different looks you’ve tried out for the site. 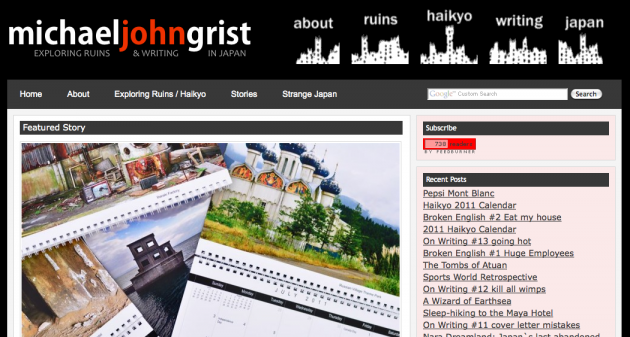 I’ve always liked the fun Japan content and I hope you will continue to try out different ideas as your site evolves… ultimately it’s YOUR website and you should publish whatever you like. Hi Geekmom, great to hear from you, and I’m so glad you like the new design. I enjoy the fun Japan content more than I feel it’s cool to admit- it makes me much more aware of the world around me, as though every day could see me discovering some cool new product or neat new public sign / piece of art. So I’ll probably keep doing that, at least once a week if I have the material. Great site. Stumbled upon it on Google looking for Ghost Towns to tour. Thanks for sharing your work. What do you shoot out of and what software do you run to get your photos the way they do. They’re excellent! Thanks Kyle! I shoot with (out of?) a Nikon d90, typically using a Tamron 18-50mm lens, occasionally wide with a Tokina 11-16mm. I use Photoshop to do most editing. Wow. I’ve been following you since version 2.0, though I somehow missed the 4.0 era (kinda glad, too cheerful for the site). Thanks for the retrospective. Your work on this site gives me hints for my own web pages. Ah, so you have websites David, care to link and share? 4.0 yes was very cheery. I was kind of teetering on how to present my stuff the best, and while I thought on it cheery was an easy placeholder. Well, rather than “website” maybe “primitive brain-dump of whatever attracts my interest for more than fifteen minutes” would be more accurate. 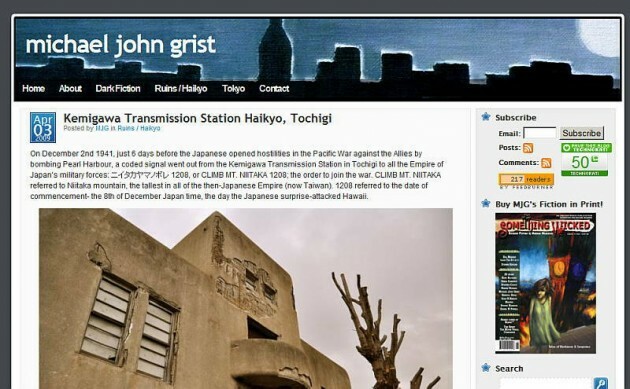 The site actually runs on a Gopher server, the World Wide Web’s now forlorn and decrepit older brother, kind of a cyber-haikyo network. For some reason, I can’t submit comments when I try to use the above URI in the Website box. To access my site, copy the above address to your browser address box, insert “http://” at the beginning, and go. I am writing a Fiction novel. Time is 1976. It involves four WW2 POWs in Japan. One young economist who got his degree in the economies of a Postwar nation. The other three are two Australian (Coast watchers) and a Polish Sailor. They put together a plan to build a postwar financial empire. These POWs were also forced labor in a small ship repair yard. Where it was able to sabotage repaired vessels to breakup only when they reach rough sea. They would sink very quickly.